Click the blue Share button in the top-right corner of your Docs window. A pop-up window appears, giving you several options for sharing your document. In the Invite People text box at the bottom of the pop-up window, enter the email address of each person with whom you wish to share your file. Be sure to separate the addresses with commas. If the email address is in your address book, Docs will try to auto-fill their information. To set the permissions of the collaborators, first click the link directly to the right of the name of the invitee. Can Edit: Allows users to edit the document and change permissions. Can Comment: Allows users to comment on the document but not to change any content or security settings. Can View: Allows users only to view the document. Select from the menu the permission setting you want to apply to this collaborator. Check the “notify people via email” box directly above the send button to notify the specified collaborators, by email, that you have shared a document with them. Your document is made available to the collaborators immediately. 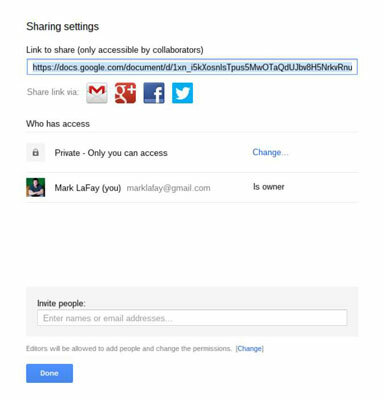 The collaborators who are invited to view, edit, or comment on your document will have to log into Google Docs using the email address with which you shared the document. If a collaborator doesn’t have a Google Account under the email address that you used, you have to invite her by using her Google Account address. She also has the option to create a Google Account using the email address to which you sent the invitation.